It's very rare to find me raving about skincare, mainly due to the fact that there are so many skin types out there it would be impossible for me to recommend anything that would definitively work for you personally. What I do want to do is to tell you about a range of skincare I have spent the last two months trialing. I want to tell you about this range simply because it has been the best combination of products I've had the pleasure of trying to date. 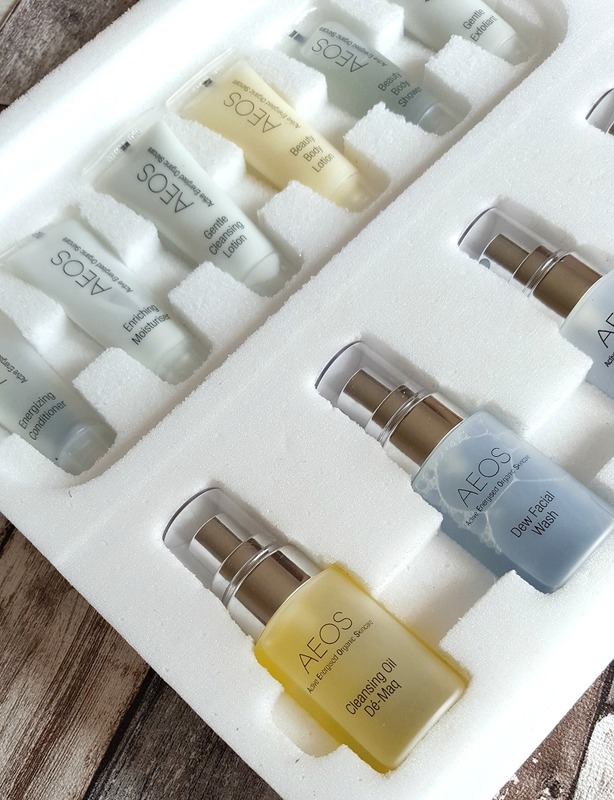 Re-wind two months and I began what was meant to be a one month trial of AEOS Skincare. A brand that boasts being cruelty free, that prides itself in it's natural ethos and a 3 Phase System that promises to renew, rebalance and replenish the skin. This meant a morning and evening routine that was laid out for me within the leaflet of information that came with my trial pack. 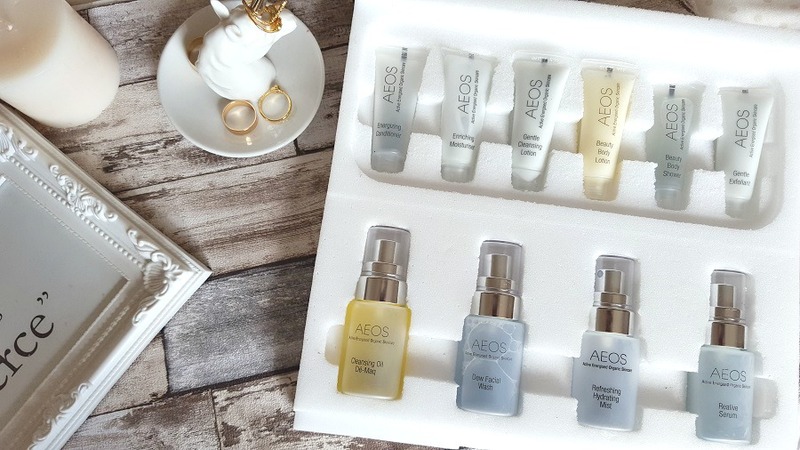 There are two skincare routines set out on the AEOS website and the one I chose to follow, as best I could, was the Optimal 'Skin Booster' Sequence, largely because my skin had been playing up on me recently and I had also wanted to really stick at a skincare routine. I made a particular effort to do this each and every time I wore makeup. I very much enjoyed how this little trial set was presented and how the routine was laid out. It felt as though AEOS had done the majority of the work for me. The only thing I will say is I would have enjoyed a 'how to use' on each product, it took me some searching to work out what to leave on, what to rinse of and how to apply on some of them but I did and I'll lay it out here for you. Simple steps that seemed to make a world of difference to my skin. Renew: I would begin with a cleanse using the Gentle Cleansing Lotion, applied to a damp face (using warm water to open pores) which I would then remove with a damp muslin cloth. I followed that once a week with the Gentle Exfoliant, applied in soft circular motions, removed by rinsing with warm water and patting dry. Rebalance: The next step was to apply the Energising Conditioner using patting motions to stimulate the skin, after that was relatively dry I'd spritz my face with the lovely Refreshing Hydrating Mist. Replenish: The last step in my morning skincare routine was to apply the Re-alive Serum which I would press into my skin with the palm of my hand. The mist primed the skin perfectly for this step! Finally came the Enriching Moisturiser. When I first sat down to read this morning routine I genuinely chuckled, never before had I had a morning skincare routine and the thought of so many steps in the morning just didn't seem doable. For the first week I kept the information leaflet to hand and would set out each product, in the order I was to use it, the night before and before I knew it I was flying through the routine in the morning. I did find that makeup applied and sat throughout the day better than it had done before and though there were some mornings I missed carrying out the routine, it didn't make a huge difference to the overall improvement of my skin. Renew: This is where my absolute favourite product from the range came into play! First up in the evening routine was the Cleansing Oil which I would gently massage onto dry skin, adding a little water at a time and I'd make the most of this step by using some facial massage techniques to really work the skin. I'd remove with warm water and because my skin tends to fall on the oily side, I'd follow that step by then using the Dew Facial Wash. This foams really nicely, not too much but enough to make you feel as though your skin is getting a thorough clean at the end of the day. I applied this using gentle circular motions and rinsed with warm water when finished. Replenish: applying Enriching Moisturiser to my dampened skin. The only deviation from this plan was that I would first use Micellar water (whichever I had to hand) and sometimes I'd use a face mask which I'd apply in between the Hydrating Mist and the Moisturiser during the evening routine. Now that my trial kit has finished, I can say with certainty that this routine made a huge difference to my skin. Granted I'd never had that in-depth a routine before but it helped so much to have the steps laid out for me. Once I got used to it I found it quite a therapeutic few minutes spent looking after my skin. I felt good about the routine and I had substantially less break outs. Any blemishes that did occur were quickly combated using the above methods and products. In my own opinion and experience, using the Cleansing Oil as a facial massage oil as opposed to a cleanser really helped to diminish blemishes when they popped up. Just for your reference, I used a combination of massage techniques as seen on Lisa Eldrige's Youtube. I found these to be soothing and relaxing and before I knew it I was looking forward to those stolen skincare moments in the evening. 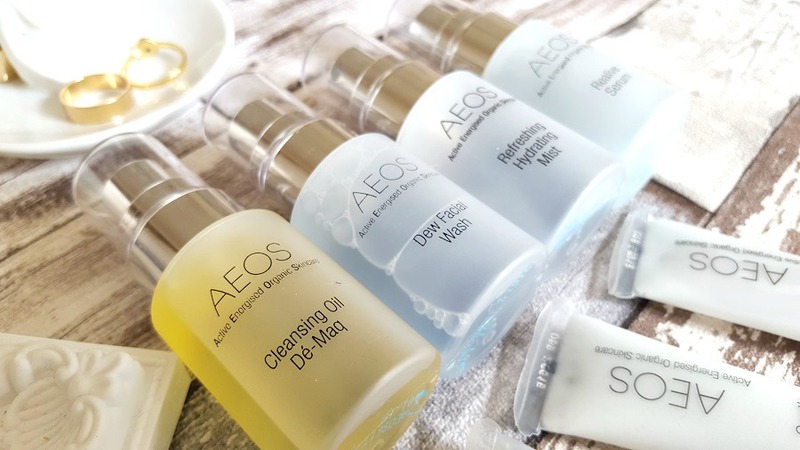 The kit I trialed was the AEOS Optimal Essentials Blue available to buy for £68 which is spendy, there's no point in me downplaying that point. It is more than I would have considered spending on a skincare routine in the past but when I sat down and worked out what I would spend on each product individually I realised it was actually a rather smart investment. There were two products in this kit that I didn't touch though and that's the only thing that would prevent me from repurchasing this in particular. I didn't see the need for the Body Shower and Body Lotion personally. That aside I was beyond impressed and have already decided to repurchase some of the (full size) products within the kit. In particular I enjoyed the Cleansing Oil, Dew Facial Wash and Enriching Moisturiser. The whole range is fairly botanical in scent though it is softly scented as opposed to other well known brands. Would I recommend AEOS? Without a doubt. I thoroughly enjoyed this trial and my skin feels so much better for it. I'm only sad I've run out though I did try to make it last as long as I possibly could! AEOS is available through www.aeos.net where you'll find lots of information on their trial kits, products, ethos and their 3 phase system.